What exactly is a cobbler? Quote Reply Topic: What exactly is a cobbler? I think this post belongs in a category called America, so correct me if I have this in the wrong place. One was a blueberry cobbler I made with a recipe from a comfort food cook book. The directions said to pour the 'crust' mix into the bottom of the pan and put the berries on top. The crust rose in between the berries, so it ran all through the cobbler. It wasn't really a crust, though; more like a spongy cake. The taste was extremely familiar, but I couldn't put my finger on it. It was almost like a blueberry muffin I had eaten at my grandma's house a few weeks earlier. The second cobbler was my mom's creation. She gets all of her recipes off of the food network website, so I'm assuming that's where she got this one. I saw in her recipe binder something for a grilled peach cobbler, but I know the grill hadn't been fired up for this dessert. The peach filling seemed to dominate the dish, and a few chunks of granola topping were spread throughout, kind of like a streusel. Both desserts were delicious, but because they were so different I'm not sure I can call them both cobblers. Maybe some artistic interpretation of recipes is to blame, but I still wanted to look into the matter. 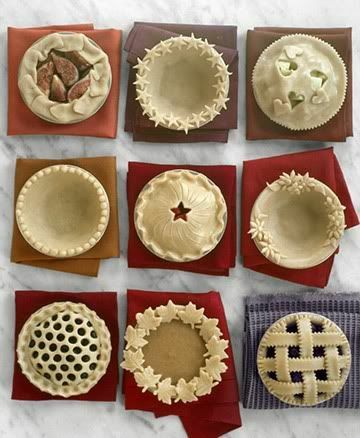 While pies, cobblers, crisps, and crumbles are all made using the same basic ingredients, they each have their own distinct variations that make them unique. 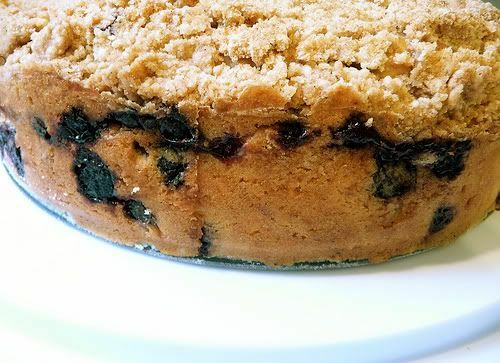 A crisp’s streusel crust is made of crumbs from biscuits, bread, and crackers among other things. 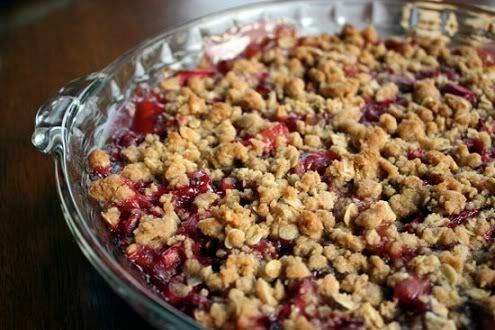 A crumble is the British version of a crisp, but the word is also synonymous with a buckle, which is something fairly different. The buckle’s crust starts as a batter that is mixed in with the fruit filling that comes out like cake. These commonly use blueberries. This dish differs from the others because of its ancient Roman origin with meat cooked inside flour and oil based pouch, like a dumpling. This idea evolved into pies as we know them today with a baked crust surrounding a fruit filling. This dessert seems to be the only one where the crust is turned into something like a work of art. These are native to New England and were created in colonial times when settlers had to make do with what little cooking equipment and available berries they had. They are typically stove top creations with a dumpling crust and fruity innards resembling pudding. Apparently they ‘grunt’ while cooking, hence the name. The crust for this classically deep-dish dessert is a crumbly biscuit that is broken up and pushed down into the fruit to allow the juicy goodness to come to the top. American colonists also created this dessert in an effort to mimic their normal English pudding. A brown betty is a pudding that generally uses apples and has buttered bread or cracker crumbs throughout. Sonker- Now, having been born in North Cackalacky, I am ashamed to say I’ve never heard of this one. It is basically a deep-dish pie that N.C.’s Surry County can call its own. What makes it special is that there is a little bit of crust with a whole lot of fruit. In the UK this means a meat or vegetable casserole with individual biscuits on top. In America however, it's a deep-dish dessert with fruit filling topped with a biscuit-like crust that rises when baked. Some have just a layer of crust on top, while others are enclosed like a pie. After all this research I’ve come to understand what I have really eaten. The blueberry dessert that I made should probably be called a buckle and the one my mom made is more like a peach crisp. The only difference I see between a pie and a cobbler is personal. A pie to me requires the crust to be rolled flat with a rolling pin and then placed on the bottom of the pan and over the fruit. Cobblers seem to be a little messier, with the fruit filling the pan and the crust dolloped on top. So while the literal definitions of pies and cobblers may be basically the same, to me it’s the way I’ve prepared them in the past and how I learned to make them. 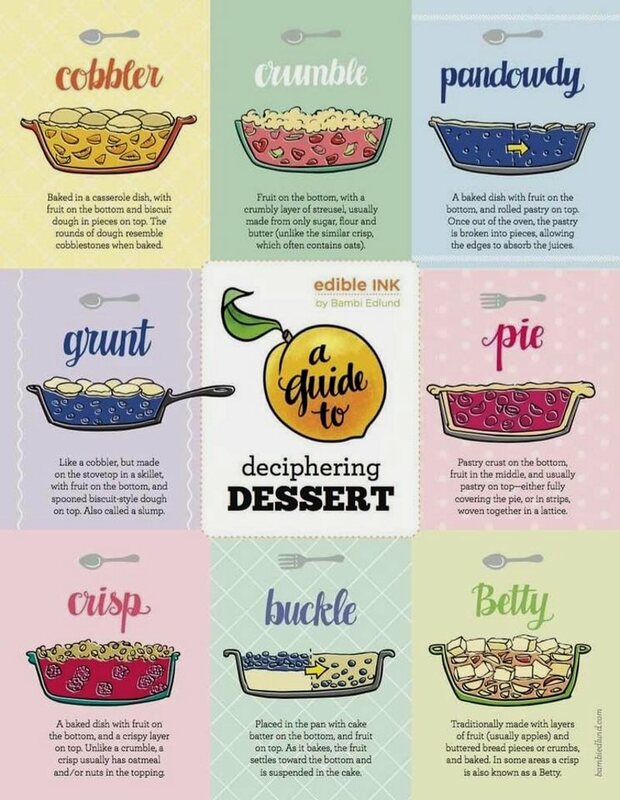 And now that I’m armed with all this new dessert information, I can’t wait to get baking! I suggest checking out this page. I must say they know what they’re talking about. 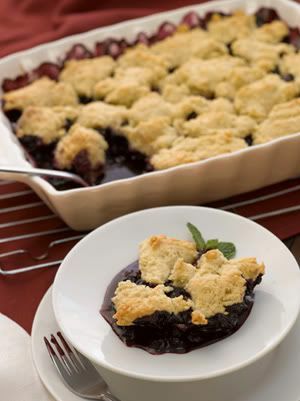 That's the way I remember cobbler Coxie...cherries on the bottom in a wonderful thick syrup, and a Bisquick topping baked to a light brown. Then served up with some whipped cream, or just cream poured over it. Really brings back some fond memories. very nice post with a ton of great information!